A 2014 Public Religion Research Institute survey of adult Americans found that 49% of those polled believe we are in the end times. Doomsday is the day the world as we know it ends. It is a day of colossal catastrophe, devastating destruction, extinction, and annihilation. A doomsday cult is a group of people led by a charismatic character who has convinced them that the end is near. A doomsayer is somebody for whom the signs of catastrophe and imminent calamity are ubiquitous. Some associate doomsday with the end of the universe and a day of judgment by some mighty being who dwells outside of the universe and occupies no space. The good will be rewarded for being good and the evil will be punished for being evil. Since most people are a mixture of both, no matter how you define these terms, it could get messy. The religious doomsayers usually refer to a sacred book that contains cryptic prophecies about the end of the world. Various books of the Bible, for example, have been sources of end-times speculation for as long as these books have been around. Some doomsayers, however, are a bit more parochial and associate doomsday with massive destruction only in their little part of the world. Some of the most active doomsayers of our time are followers of the Abrahamic religions and believe that prior to judgment day there will be a great battle. Many Christians believe the final war will occur at Armageddon between the forces of good, led by Abraham's god [AG], and the forces of evil, led by Satan. It is likely that no spectators will be allowed at Armageddon (so you better pick your side now), which is said to be located in modern Israel. How billions of people will fit into this tiny space is a mystery that I'm sure theologians have worked out to the satisfaction of their undemanding clients. Doomsday has been predicted many times by many prophets. Obviously, so far they've all been wrong, which lowers the odds that any given prophecy that the world will end on some specific date will come true. Some, like the Jehovah's Witnesses, have been wrong so many times that they've quit making specific predictions, but they're still warning us that the end is near. Not to worry; there are plenty of others who continue to howl that the end is near. A recent example is the Strong City cult led by Michael Travesser (aka Wayne Bent), who claims he is the messiah and predicted the world would end at midnight on 31 October 2007. Another recent example of a failed doomsday prediction is that of Harold Camping, an 89-year-old self-styled expert in the scriptures who told his followers that his interpretations of the Bible had uncovered the true date of the end of the world: 21 May 2011. 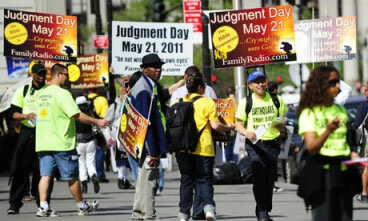 Camping, who has made millions promoting his religious ideas on Family Radio, spent more than $100 million on a worldwide advertising campaign proclaiming Judgment Day. Not all those who claim to know when the end will come are motivated by supernatural signs, however. Some predict massive destruction will come to Earth when the planets align in a certain way. 5 February 1962 was such a day and seers such as Jeanne Dixon predicted the end of the world would occur then. 10 March 1982 was supposed to be a day of devastating earthquakes, according to John Gribbin and Stephen Plagemann in The Jupiter Effect. Another day for planetary alignment and predicted mass destruction on Earth was 5 May 2000. * Richard Noone took advantage of people's fears to exploit that date in his book 5/5/2000 Ice: the Ultimate Disaster. Doomsday cults have also been associated with UFOs and aliens who are to take followers to another planet while Earth is destroyed. In the 1950s, Marian Keech led such a cult. When the world didn't end and their space ship didn't arrive to take them away, Keech told her followers that their faith had saved both them and the world. Nice touch. Not all doomsday cults end so sweetly, however. In 1997, 39 members of a UFO cult known as "Heaven's Gate" committed suicide as a condition for preparing themselves for transport on a space-alien craft to another world. Q. Is there a planet or brown dwarf called Nibiru or Eris that is approaching the Earth and threatening our planet with widespread destruction? A. No: Nibiru and other stories about wayward planets are an Internet hoax. There is no factual basis for these claims, and most of them (such as that Nibiru has been hiding behind the Sun or that it will be visible to the naked eye from the southern hemisphere next year) are ludicrous. Eris is real, but it is a dwarf planet similar to Pluto that will remain in the outer solar system; the closest it can come to Earth is about 4 billion miles. The Niburu hoax has been linked by some doomsayers with the Old Testament (and they have photos to prove it!) and by others with the belief that the ancient Maya predicted that the world would end in 2012. The Maya, however, knew as little about our planet's future demise as Gordon-Michael Scallion, St. Malachy, Edgar Cayce, Zecharia Sitchin,or Nostradamus, all of whom falsely predicted colossal catastrophes for our planet. The world is no more likely to end when the Mayan calendar ends than it is likely to end when a modern calendar hits 31 December. There is a story, perhaps apocryphal, that the great scientists Isaac Newton (1643-1727) and Robert Boyle (1627-1691) belonged to different Bible-reading groups while both resided in London. At one end of town, Newton was trying to calculate the exact moment of creation, while at the other end of town Boyle and his group were working on calculating the exact day the world would end. The story can't be true, some think, because Newton liked to work alone, or rather nobody liked to work with him. I don't know if the story is true, but it illustrates a universal trait about human beings: a fascination with our origins and our ultimate demise. By the way, the universe was created at midnight on 23 October 4004 BCE and will end on 23 October 1996. Bishop Ussher calculated that Adam and Eve were driven from Paradise on 10 November 4004 BCE, only a couple of weeks after being created. You don't believe it? Then, you probably didn't see the world end in 1996. Until recently, if we wanted to explain our origin or our ultimate demise, we were restricted to creating myths about the beginning and end of our species. For thousands of years, we could only guess at where we came from and where we were going to end up. "For 160,00 years, superstition held Homo sapiens captive," as Bob Park puts it. * Science has emerged only in the last few hundred years. Now, thanks to Charles Darwin and others we have a pretty good idea of where we came from. 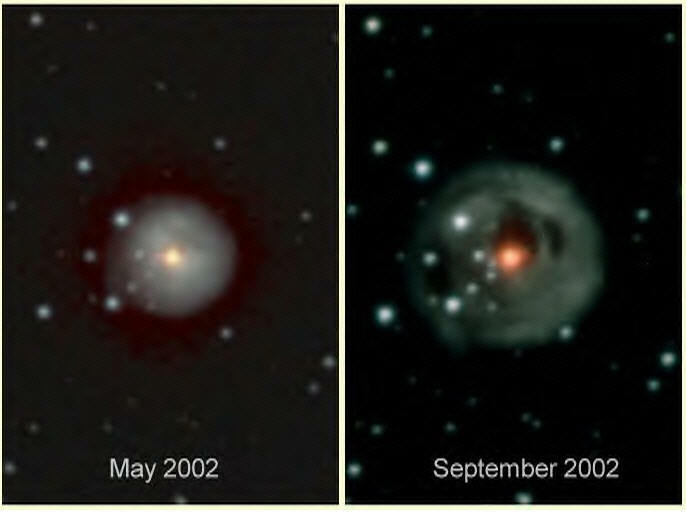 Thanks to many physicists and astronomers, we have a pretty good idea of how it's probably going to end. Superstitious myths about our origins and ultimate demise still abound among the religious and anti-scientific secularists, but they do little damage to the progress of science. Those doing science either reject the religious myths of our ancestral storytellers as products of creative minds that tried to understand the universe using little more than their imaginations and the feedback they got from equally ignorant folks sitting around a campfire, or they have figured out a way to interpret the myths to make them seem compatible with modern science. Those who attempt to force modern science into the mold of their religious myths are not doing science and are little more than a constant nuisance. Many myths report doomsday events, but they usually provide no way to test their claims. If they do, the claims don't stand up to scientific scrutiny. When scientists claim that there have already been doomsday events on Earth, such as being hit with a giant meteoroid some 65 million years ago, they produce evidence and counter-evidence, and argue until the claim is either rejected or accepted by the majority of those in the field. When scientists tell us that we could get hit again by another huge object from outer space, we take them seriously and do not wonder if their revelation came from an all-knowing being from the Great Beyond. In fact, there have been several mass extinctions of species (more than 99% of all the species that have ever existed on Earth are extinct). We could be rendered extinct from solar flares, gamma ray bursts, super novae, or black holes, to name just a few of the ways nature could get rid of us. Our whole galaxy could be swallowed up by some other galaxy. We could be blasted by another huge meteoroid. We could see our species depleted to the (metaphorical) Adam and Eve stage from a massive plague caused by the release of some mighty microbe or by massive poisoning of our air, water, and food as globalization leads to universal deregulation of all industries in an attempt to expand world markets indefinitely. We could blow up the planet with nuclear bombs. The odds of any of these things happening are small, but they are not impossible. Whether you should worry about them is up to you. But you might want to think twice before scaring your children into thinking that the end is at hand. One plausible scenario is that our sun dies and the planet becomes a frozen mass some five billion years from now. Nobody will be around to observe it, however, since all life on Earth will have been extinguished millions or billions of years earlier. Most end-times doomsayers seem to be unmoved by the enormous amount of scientific data available to anyone truly interested in the end of the universe. Instead, when an event seems to them like an end-time event—such as the terrorist attacks on the World Trade Center and the Pentagon on 11 September 2001, or the collapse of world banking in October 2008—they turn to the Bible or someone like Nostradamus for guidance. There have always been people who see catastrophic events as signs that the end is near, yet an understanding of history and science should console us: every generation has seen catastrophic events, some generated by nature and some generated by our fellow human beings. There has never been a time when things weren't uncertain and dangerous for human groups, from families to tribes to nations. Associated with some doomsday beliefs is the notion that before the end comes some sort of savior will arrive to warn everybody. These saviors have been many, but the best-known is Jesus of Nazareth (or Bethlehem) known as the Christ and Savior to a billion or so Christians. Jesus seems clearly to have taught that the end of the world and the Second Coming was at hand. That was 2,000 years ago. Some are still waiting for the messiah. In the meantime, several messiahs have come and gone. In the seventeenth-century, for example, it was widely believed in England that the end of the world was at hand. One of the leading rabbis of the time and a teacher of Spinoza, Menasseh Ben Israel, let it be known that 1666 was the year the messiah would come. According to tradition, before that could happen the Jews had to be spread to the "four corners of the earth." Ben Israel convinced Cromwell to let the Jews back into England on these grounds. Perhaps he hinted to the megalomaniacal Cromwell that he himself was the chosen one. In any case, several people announced they were the messiah, but we'll mention just one: Sabbatai Zevi (1626-1676?). In the nineteenth century, the Baptist preacher William Miller (1782–1849) said the world would end on 22 October 1844. Miller is credited with being the inspiration behind the Adventist movement of the 1830s and 1840s in North America and other movements that emphasized Biblical prophecy. Being wrong is rarely considered a fault by the faithful. Miller's followers called the failure of the world to end as predicted "The Great Disappointment." A Millerite named Hiram Edson wrote: "Our fondest hopes and expectations were blasted, and such a spirit of weeping came over us as I never experienced before....We wept, and wept, till the day dawn." Miller thought there might be some error in the Biblical chronology, but he never gave up his belief that the Second Coming was imminent. He wanted to keep that happy thought alive, as does preacher Ronald Weinland, who predicted the world would end in 2010. The continued popularity of doomsday beliefs is illustrated by the popularity of the Left Behind series of books and films, based on a Biblical interpretation that involves something called the rapture. Millions of copies of the novels have been sold. And despite the preposterous nature of the belief, millions of people apparently expect to have their bodies separated from their clothes and jewelry as they are teleported to some supernatural dimension. As noted above, however, not all doomsayers are religious prophets. Some look to science as the likely cause of the end of the world. I grew up during the so-called Cold War, when the United States and the former Soviet Union tried to outpace each other in developing nuclear weapons. What began as a race to develop the most powerful weapons of mass destruction in history gradually gave way to a philosophical position known as nuclear deterrence. Even though both sides eventually had enough weapons to destroy our species many times over, neither side would use its weapons because to do so meant extinction for them as well. Now the great fear is that nuclear material will get into the hands of terrorists or a rogue nation like Iran, which might use the weapon against Israel. Some end-times doomsayers might long for such a day, because they believe that Israel will be the site of the last battle on Earth, at Armageddon, mentioned above. In fact, despite the widespread destruction terrorists or Iran might cause, it is unlikely that they will bring about the end of the world. In any case, if they do, the irony will be that the only reason some obscure passage in one book of the Bible had anything to do with the end of the world is that some people, in their zest for the end of life on Earth, hastened the event by rationalizing that their bad behavior was AG's will. A recent example of the belief that science will bring about the end of the world concerns the Large Hadron Collider (LHC), buried in the mountains on the Swiss/French border. Before it was turned on, some non-scientists feared it would create a black hole that would devour us. A lawyer in Hawaii named Walter Wagner sounded the alarm. According to Bob Park, Wagner "read far too much science fiction as a youth" and "fantasizes that he is a physicist by virtue of an undergraduate biology degree with a minor in physics." Wagner worries that the LHC is "a doomsday machine that ... is posed to destroy the world by creating a black hole." How? By smashing particles into one another. Scientists aren't too worried, since nature has been smashing particles into one another on Earth and on the Moon for billions of years with much greater energy than the LHC will be able to muster. So far no black holes have occurred on either the Earth or the Moon, and last I checked, both were still floating in space with one orbiting the other. Some people think that the attraction of doomsday thoughts is linked to the desire to find meaning and significance in life. * Apparently, some people's lives seem worthless unless they can die and live some other sort of existence in a dream world populated by spirits who spend eternity worshipping their maker. I think we can safely ignore the religious end-times doomsayers. The same can't be said for all those who warn us of impending doom if we don't change our ways. Some of our behaviors may turn out to lead to truly catastrophic destruction of our planet and our species. Nobody can see that far into the future, however, to know for certain which of the doomsayers are right. We should be able to weed out the Chicken Littles like Richard Noone and Walter Wagner rather easily and without much controversy. The task is more difficult when evaluating the claims of those who see a future of catastrophic destruction from climate change, genetic engineering, various forms of pollution, or depletion of natural resources. We have to be careful of the bandwagon effect from consensus viewpoints, as well as of contrarian claims masquerading as significant objections to the consensus. There will never be universal consensus among scientists and other informed people regarding these controversial issues. Any action taken will have to be based on probability and carry with it some degree of uncertainty. We need fear being wrong much less than we need fear having ideas stifled because they don't fit with someone's political agenda. We may make the right decisions for the wrong reasons, but that hope is not a principle the future of our planet should depend on. See also cults, Mayan prophecy (2012), my blog on "Disasters", my review of the movie "Signs," and "Apocalypse now? I may be a fool, but I have my reasons." Boyer, Paul. (1994). When Time Shall Be No More: Prophecy Belief in Modern American Culture. Belknap Press. Goldish, M. and R. H. Popkin, eds. Millenarianism and Messianism in Early Modern European Culture Volume I: Jewish Messianism in the Early Modern World. (2001). Springer. Hunt, Stephen J. ed. (2000). Christian Millenarianism: From the Early Church to Waco. Indiana University Press. Kunstler, James Howard. 2006. The Long Emergency: Surviving the End of Oil, Climate Change, and Other Converging Catastrophes of the Twenty-First Century. Grove Press. McGrath, Ben. American Chronicles, “The Dystopians,” The New Yorker, January 26, 2009. Morrison, David. (2008). "The Myth of Niburu and the End of the World in 2012," Skeptical Inquirer, September/October. Orlov, Dmitry. 2008. Reinventing Collapse: The Soviet Example and American Prospects. New Society Publishers. Plait, Philip. (2008). Death from the Skies! : These Are the Ways the World Will End...Viking Adult. Popkin, Richard. (2002). "Two Jewish Heresies: Spinozism and Sabbatianism," in Histories of Heresy in the 17th and 18th Centuries: For, Against, and Beyond Persecution and Toleration edited by John Christian Laursen; Palgrave Macmillan, pp. 171-184. Smith, P. D. (2007). Doomsday Men: The Real Dr. Strangelove and the Dream of the Superweapon. St. Martin's Press. Taleb, Nassim Nicholas. 2007. The Black Swan: The Impact of the Highly Improbable. Random House. Tyson, Neil deGrasse. (2007). Death by Black Hole: And Other Cosmic Quandaries. W. W. Norton. On the Road to Armageddon "In a recent Time/CNN poll, more than one-third of Americans said that since the terrorist attacks of 9/11, they have been thinking more about how current events might be leading to the end of the world. While only 36 percent of all Americans believe that the Bible is God's Word and should be taken literally, 59 percent say they believe that events predicted in the Book of Revelation will come to pass. Almost one out of four Americans believes that 9/11 was predicted in the Bible, and nearly one in five believes that he or she will live long enough to see the end of the world. Even more significant for this study, over one-third of those Americans who support Israel report that they do so because they believe the Bible teaches that the Jews must possess their own country in the Holy Land before Jesus can return." Biblical scholar's date for rapture: May 21, 2011 Harold Camping lets out a hearty chuckle when he considers the people who believe the world will end in 2012. "That date has not one stitch of biblical authority," Camping says. No, but this civil engineer has calculated that by the time the Maya long calendar ends, the rapture will have happened and the world will have ended. This isn't Camping's first guess at the end. He was wrong before and I predict (based on non-biblical data) that he will be wrong again. 24 Mar 2011. Matt wrote to tell me he'd been given a pamphlet in a Lowe's hardware parking lot. You can read ANOTHER INFALLIBLE PROOF THAT GOD GIVES THAT ASSURES THE RAPTURE WILL OCCUR MAY 21, 2011 by clicking here. 16 May 2011. Matt wrote again to inform us "of a sorrowful example" of the repercussions of Camping's folly: Is The End Nigh? We'll Know Soon Enough Brian Haubert, a 33-year-old actuary, says "I've crunched the numbers, and it's going to happen." He thinks the Bible contains coded "proofs" that reveal the timing. For example, he says, from the time of Noah's flood to May 21, 2011, is exactly 7,000 years. Hey, he's an actuary and actuaries just know these things. Especially divinely inspired actuaries. "Knowing the date of the end of the world changes all your future plans," says 27-year-old Adrienne Martinez. She thought she'd go to medical school, until she began tuning in to Family Radio. She and her husband, Joel, lived and worked in New York City. But a year ago, they decided they wanted to spend their remaining time on Earth with their infant daughter. "My mentality was, why are we going to work for more money? It just seemed kind of greedy to me. And unnecessary," she says. And so, her husband adds, "[Abraham's god] just made it possible — he opened doors. He allowed us to quit our jobs, and we just moved, and here we are." Now they are in Orlando, in a rented house, passing out tracts and reading the Bible. Their daughter is 2 years old, and their second child is due in June. Joel says they're spending the last of their savings. They don't see a need for one more dollar. And nobody will charge them with child abuse on May 22. Print versions available in Dutch, ,Russian, Japanese, and Korean.